NR Appendix 1 "Autumn at Taos"
NR_Appendix 2: "Lawrence to Margaret King"
NR_Appendix 3: "Lawrence to Catherine Carswell"
NR_Appendix 4: "Pan in America"
“On the feast of Epiphany, as a special treat, was given a poetic drama by D'Annunzio, La Fiaccola sotto il Moggio—The Light under the Bushel. 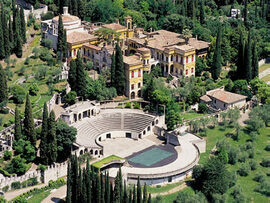 Considered by some travel guides as the highlight of Lake Garda, Il Vittoriale was formerly the villa and estate of Lawrence’s contemporary, the Italian playwright, poet, novelist, soldier and national public figure, Gabriele D’Annunzio (1863–1938). It is an extraordinary complex of buildings and gardens overlooking the lake, featuring, amongst other things, the ornately furnished villa itself (the Prioria), a neo-classical amphitheatre, a museum, D’Annunzio’s mausoleum, a rich collection of art and literature and, perched surreally up in the cypress trees of the park, the prow of the battleship Puglia, which D’Annunzio used in his “adventure” to lay claim to Fiume (now Rijeka) in 1919. 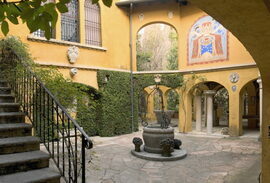 The biplane which D’Annunzio used in another famous escapade during the First World War, “the flight over Vienna” of 1918, can also be seen hanging from the ceiling of one of the buildings of the villa. 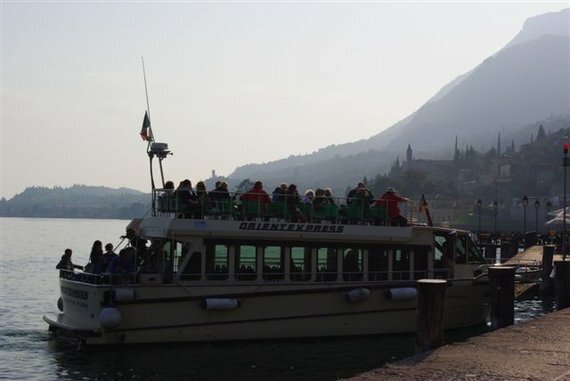 Coach departure from Gargnano, 12:45, arrive in Gardone approx. 1:00. Coach departure from Gardone, 4:45, arriving back at approx. 5:00. Delegates to make their own arrangements for lunch. 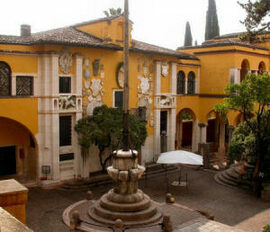 Refreshments are available in the grounds of Il Vittoriale, but there are also cafes and restaurants in Gardone. 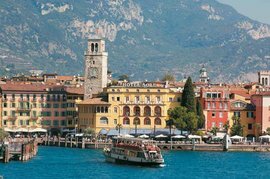 Riva del Garda, at the narrow northern tip of Lake Garda and surrounded by dramatic mountain scenery, has been one of the lake’s most popular resorts since the late nineteenth century. It was here that Lawrence and Frieda first arrived at the lake on 4 September 1912 after their month-long journey – largely on foot – over the Alps from Bavaria. They stayed here, at the Villa Leonardi, for two weeks before taking the steamer down the lake to Gargnano on 18 September. On this trip, then, we may not exactly be following in Lawrence’s footsteps, but we will certainly be sailing in his wake! Each leg of the journey will take around ninety minutes, so there will be plenty of time to soak up the spectacular views as we sail along the lake – and we will pass Muslone, above which is San Gaudenzio, where Lawrence and Frieda spent a week just before they left the lake in April 1913, as well as Campione, to which they made an excursion on 16 February of that year. Once at Riva, we may in fact follow in some of Lawrence’s footsteps after all, as we take a guided walk to relevant places of interest around the town. Depart from Gargnano 9:30 arriving in Riva at approximately 11:00. Price of boat-fare to be confirmed, depending on numbers and size of boat. From Lawrence's "A Bad Beginning" and across the years to favor us with a good beginning! The sun is in my eyes, I must get up. My breast--which is so sore. Am I. Which way are you coming?"